The Kindergarten year is defined by increased independence, academic stamina, and community building across our classroom. Kindergarteners at Léman are curious learners, eager to observe and question the world around them. They are empathetic friends and collaborators who ask meaningful, relevant questions and actively participate in group activities and discussions. 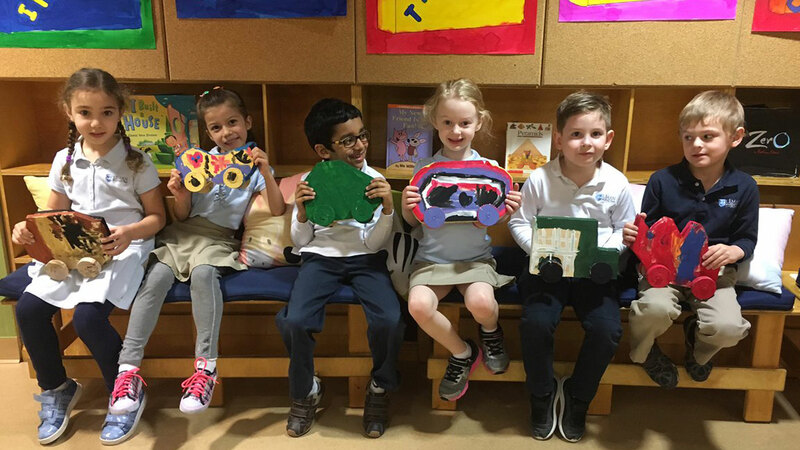 Our Kindergarten curriculum is focused on building proficiency in literacy, mathematics, and world languages while incorporating interdisciplinary learning across the arts, social studies and science. Using a balanced literacy approach, we intertwine phonics with reading and writing workshop to ensure our students have developed strong foundational skills. The integration of interactive read-alouds, small group work, collaborative partner reading, and individual conferences provides each student with differentiated opportunities to achieve their personal literacy goals. Throughout the year in literacy centers, students engage in a multisensory approach to review the alphabet and learn each letter's corresponding sound. Phonemic awareness is strengthened through blending phonemes, rhyming word families, and decoding words. To support their development in reading and writing, students are exposed to foundational spelling patterns and high-frequency sight words. Corresponding with the introduction of each letter, students are taught motor-plans for writing lowercase letters. Students build strong foundational reading skills by reading books at their individual reading level and implementing reading strategies such as: using picture cues, matching words to the printed text, and sounding out words. These skills are reinforced in small differentiated groups during reading workshops in guided reading. 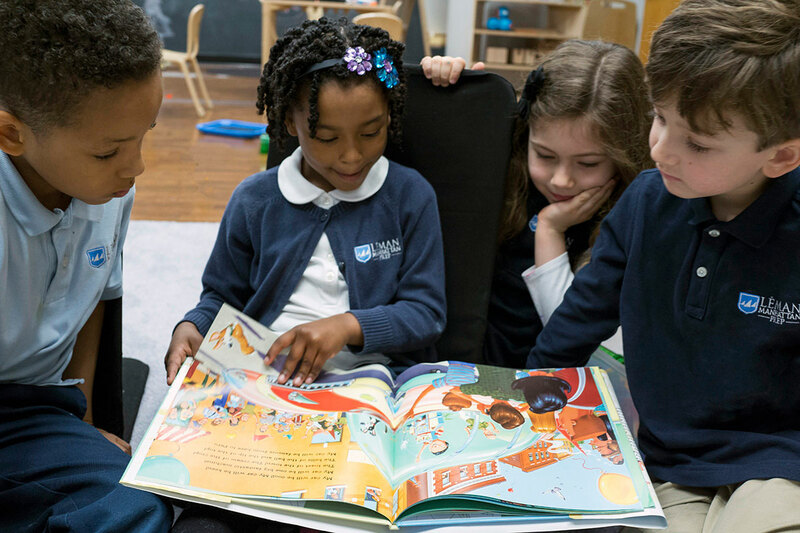 To develop reading comprehension skills, children are encouraged to make predictions, explain personal connections, and discuss stories with their peers. Children practice several writing strategies as they build their understanding of letters and sounds. They are given many opportunities to express their thoughts and ideas through drawing, dictation, and labeling. Students learn to brainstorm, organize their ideas, edit their work, and collaborate with their peers as they celebrate the writing process. Students build independence by using environmental tools such as the Word Wall, anchor charts, and mentor texts. Throughout the year students confer individually with teachers to review their writing and reflect on their personal goals. Writing units include small moments, pattern books, all about books, how-to books, and opinion-writing pieces as well as an ongoing narrative: weekend news. 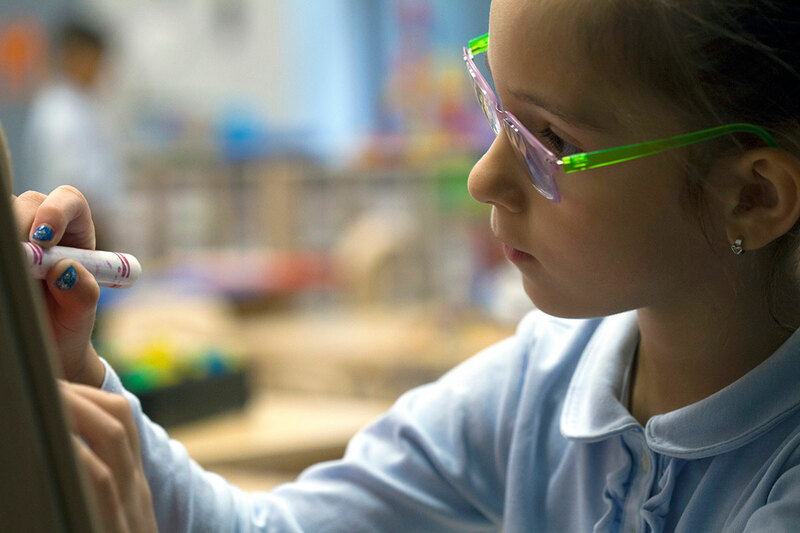 In Mathematics, students develop problem-solving and critical-thinking skills by working with manipulatives, such as pattern blocks, counting bears, colored tiles, and unifix cubes. These tools are used to strengthen their number sense and understanding of numerical relationships, as well as to identify, create, and extend patterns. Students work to build their number awareness by counting objects, recognizing numbers, building combinations of one- and two-digit numbers, creating and solving basic equations, and through number stories. Students also work to develop their skills of measurement, graphing, sorting, composing and decomposing number combinations, and time through a variety of engaging activities..
Our year begins with a study of self and expands to include our responsibilities as members of a classroom community. Students create self-portraits and discover many ways in which they are similar and different from their peers. Then, students engage in a family study where they focus on the differences within the family structure, highlighting immediate and extended family members. Our studies continue as we learn and discuss communities and how they grow and change. We begin with conversations about the components of a classroom and then expand our focus to discuss our school community and the neighborhood. In Science, students explore changes in the world around them. The integrated curriculum focuses on paleontology, weather, rocks and minerals, life science, and the human body. Throughout the year, students learn how to make observations by using their senses and creating inferences based on the observations they make. In the fall, students explore the differences between living and non-living things and investigate the variations that exist among individual plants or animals. Then, during the winter and spring months, students use scientific tools to observe changes to evaluate weather patterns. In Kindergarten, we use a variety of familiar themes to expose students to the meaning of the language, preparing them for more advanced language acquisition in future years. Students learn Mandarin through stories, games, songs, and music. The class approach is based on Comprehensible Input which allows students to easily access the meaning of the language through what they hear and see. Students learn all content in very familiar, simple, and engaging contexts in order to receive the language input they need to develop proficiency. In Kindergarten, we use a variety of familiar themes to expose students to the meaning of the language, preparing them for more advanced language acquisition in the future. Students learn Spanish through stories, games, songs, and music. The class approach is based on Comprehensible Input which allows students to easily access the meaning of the language through what they hear and see. Students learn all content in very familiar, simple, and engaging contexts in order to receive the language input they need to develop proficiency. In Kindergarten, we use a variety of familiar themes to expose students to the meaning of the language, preparing them for more advanced language acquisition in the future. Students learn French through stories, games, songs, and music. The class approach is based on Comprehensible Input which allows students to easily access the meaning of the language through what they hear and see. Students learn all content in very familiar, simple, and engaging contexts in order to receive the language input they need to develop proficiency. We begin with painting. Using a limited palette, the students explore the primary colors and determine how secondary colors can be made. Students work to cover their whole paper with many colors. We continue with collage, examining the work of Eric Carle, cutting up the painted papers we make, and using them to create fish, parks, people, and abstract designs. We look at work by sculptors such as Richard Serra, an artist whose work is all about standing, leaning, and balancing. We continue to think sculpturally when we work with clay. The semester ends with different forms of weaving and interlocking materials. The woodworking curriculum is centered on four main principles: the practice of individual safety and awareness of others; teamwork and cooperation between students; the development of tool usage; and a lasting sense of accomplishment and success. The overall goal of the program is for students to increase motor skills and tool usage, as well as develop a strong sense of personal accomplishment, success, and ownership by completing meaningful projects. Students learn how to use straight and coping saws, safety goggles, files, c-clamps, hammers, and wood glue to build their projects. Once the project is assembled, students further design their project with paint and ink to give it a finished quality and to promote ownership and achievement. In Kindergarten Music, vocal technique, ear training, musicianship, and music literacy are developed through a variety of structured and engaging activities. Echo singing of tonal patterns and traditional melodies continues to be an important part of every class. In the spring semester, students are introduced to the violin. Beginning with a focus on rest position, playing position, and instrument safety, students use foam violins and the “TOPS” song to learn about proper violin posture and practice the steps to transition from rest position to playing position. Soon they make the exciting switch to real violins and practice making a beautiful pizzicato sound by gently plucking the strings. Our curriculum is integrated, and we try to reinforce many of the concepts that are being taught in the classroom in physical education, including our study of the four seasons, pattern development, and the alphabet and animal movements. Creative movement is a large part of our curriculum. The highlight of our year is our circus arts unit. During this unit, students learn how to juggle scarves, walk on bucket stilts, and practice balancing. We conclude the year playing games that reinforce problem-solving and cooperation. Throughout the year, students learn and practice exhaling underwater or “blowing bubbles”, floating (supine and prone floating), streamline ready position, and flutter kicking. Differentiated instruction is crucial to the swimming development of each student. Students often work in small skills-based groups to ensure each student receives the attention they require to progress. As the skill level of the student progresses, they will learn how to combine multiple skills, such as the transition from “ready position” to streamlining off the wall and gliding while exhaling from their nose. These are the beginning steps to learning the front crawl stroke. With practice, students will be challenged to complete a 25-yard swim. After School Programming is available from 3:15 PM to 5:45 PM and includes a range of classes from French to Chess. Pricing varies by number of days enrolled. Please contact the admissions team for more information. We are now accepting applications for 2019-2020. 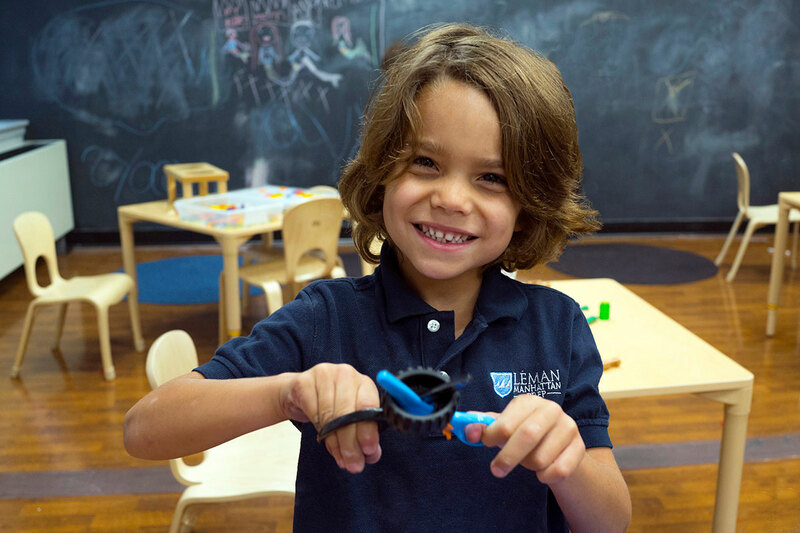 For information on applying visit the Léman Kindergarten Application Process page. Please email the admissions team or call 646-632-1284 for more information.